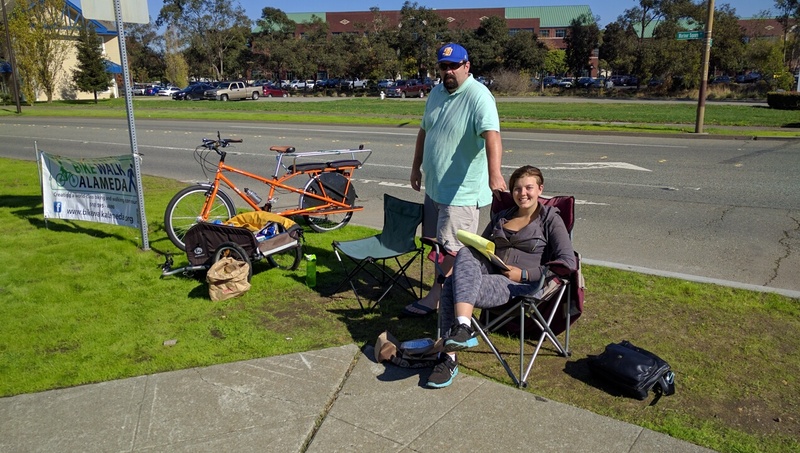 Brian McGuire and Marisa Wood took the afternoon shift counting pedestrians and cyclists at the Alameda end of the Posey tube. Photo: Streetsblog. Advocate-volunteers with BikeWalk Alameda took shifts today counting cyclists and pedestrians passing through the Posey Tube on their way between western Alameda and Oakland. The count will be used to help push for a pedestrian and bicycle drawbridge between Alameda and Jack London Square, across the Alameda estuary. Streetsblog readers will recall that several studies have been done, the first in 2006. That one was a response to the Alameda Landing developments, which would be a short bike ride from downtown Oakland and BART if not for the Alameda Estuary. The fear is that without walking and biking connections to the mainland, the tubes will eventually gridlock. BART is so close, by the way, that one can hear the trains from the landing. But currently the only way across the estuary is by car or bus or by walking or biking the supposed bike/ped path attached to the wall of the Posey Tube. 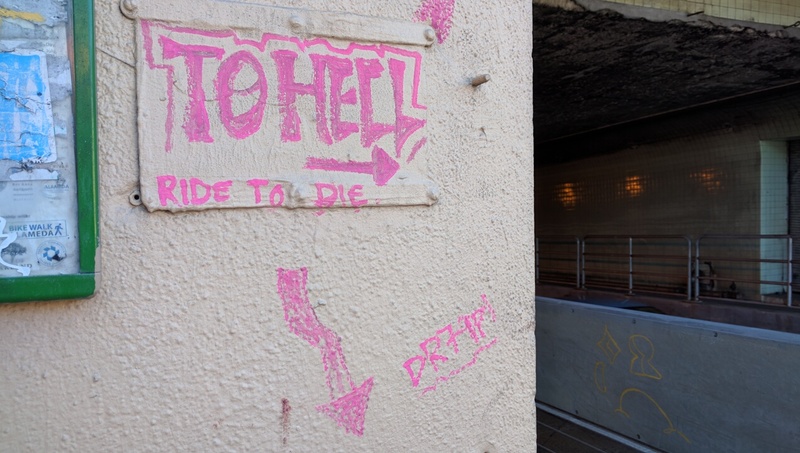 It’s difficult to describe how awful the tunnel is between the roar of passing traffic, the filthy wall, and the ever-present soot and car exhaust. Streetsblog had to dismount and squeeze past another cyclist, because there isn’t enough room to pass. Plenty has been written about how bad this crossing is, but it’s difficult to appreciate without riding or walking it. As a cyclist who has ridden everywhere from Rotterdam to Tokyo, this is without question the most pathetic excuse for bicycle infrastructure I have ever seen. 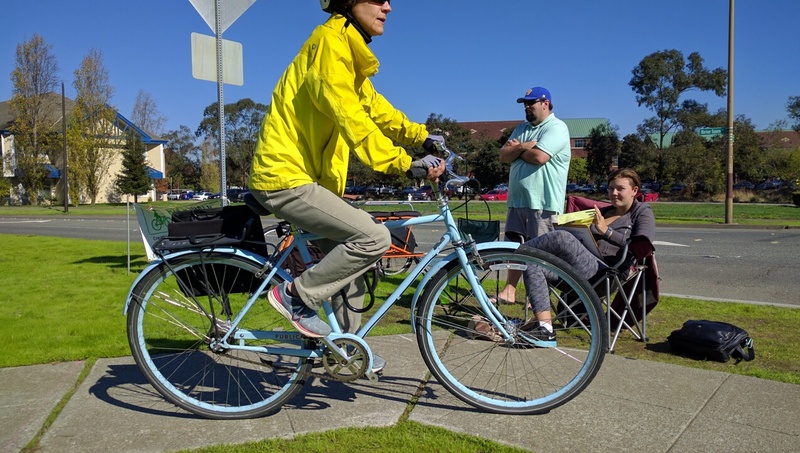 It’s especially scandalous considering that the Posey tube bike and ped path is frequently used by students traveling between Laney College in Oakland and the College of Alameda, explained Marisa Wood, who was also out counting bikes and pedestrians. It’s not surprising that McGuire and Wood only counted a handful of cyclists in the hour they were out. McGuire said most people either take the bus, drive, or bike out of their way to use the Park Street bridge to the east. “People from the middle of the island go to Park Street, even if it adds twenty or thirdy minutes to their bike ride,” he said. The advocates counted cyclists crossing at Park Street too and, said McGuire, they see far more there than at Posey. But there has been an increase in cycling at both locations over the past ten years. The advocates, meanwhile, will use these numbers to show that a suitable crossing from western Alameda to Jack London and Oakland would have numbers at least as high as the Park Street bridge, which has a wide, reasonably inviting bike and pedestrian path. Meanwhile, Lucy Gigli, President/Advocacy Director and co-founder of BikeWalkAlameda, shared some rough calculations from today’s counts: she said there’s been a 65 percent increase over the past ten years in cycling through Posey, despite the noxious conditions in the tunnel. On a related point, Streetsblog was dismayed to see developers boasting that the new Alameda Landing developments are “pedestrian friendly,” even though they are directly across the street from giant parking lots and wide intersections with five or six lanes and turning pockets. There are sidewalks at least, but Streetsblog didn’t see anyone using them, except for a woman taking groceries to her car. 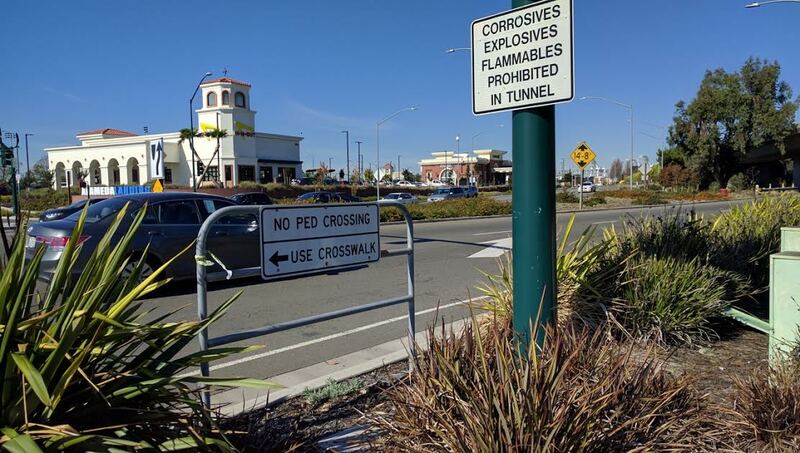 Streetsblog will wait for BikeWalk Alameda to finish its counts, but it’s pretty obvious that some kind of long-term solution–and a car-free drawbridge seems to be the best answer–is needed to allow pedestrians and cyclists to get between western Alameda and Oakland safely. Meanwhile, the fact that the Posey path has remained the only way to bike or walk across for all these years shows that California has failed to adhere to even minimal pedestrian and bicycle standards. 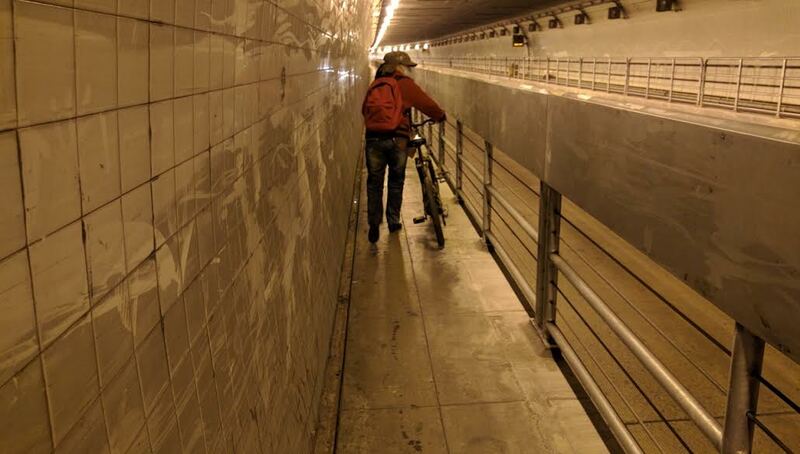 The picture of the Posey Tube bike lane reminds me of San Francisco’s Broadway Tunnel pedestrian/bike lane. A terrible way to travel. It really is a bad situation. The last time I navigated it on the bike there were two bikes and a pedestrian oncoming and there simply wasn’t enough room to pass. We had to line up behind our bikes, pushing them past, while one bike was lifted slightly over the railing to make room. At a minimum, they need to open another lane to have dedicated travel in each direction. Move the fire suppression equipment up to the ceiling and open the other side. And clean it regularly! It’s such a waste. Alameda has tremendous potential to be an active transportation oasis in the bay area (v. low speed limits, flat, warm, etc…), but without a decent way for pedestrians and bikers to get on and off the island, it’s becoming more and more car-centric as the population grows. The REGION needs to do something about that yesterday. Is Caltrans serious about reducing SOV travel? They have a really easy option here, please don’t waste it!!! The older parts of Alameda are a bicyclist and pedestrian’s dream. The entire Alameda Landing area, however, is a junky suburban development pattern that was copy-and-pasted from some car-centric suburb like Dublin or Antioch. This development is way out of character with the surrounding neighborhood. 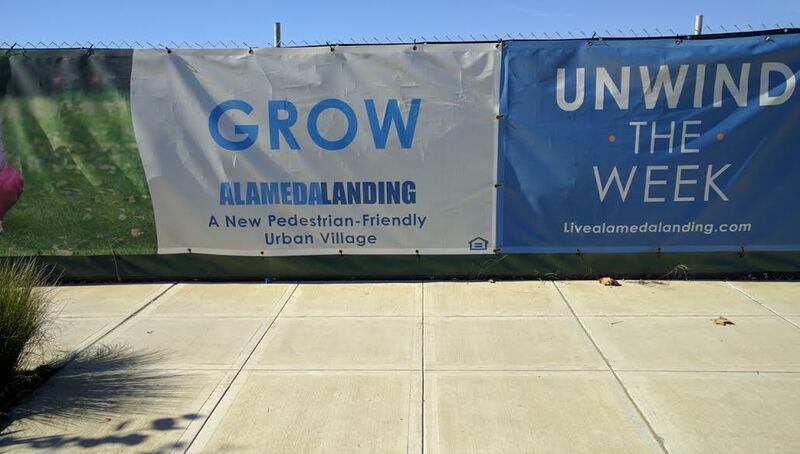 The fact that Alameda authorized the development as is is an embarrassment. The awful Posy Tube is just icing on the cake. Pretty much anything that could be done wrong in this area was, and the fact that this development is only a couple years old makes me question our current development policies. A pedestrian bridge between Alameda Landing and Jack London Square would be a big step in the right direction, but Alameda Landing needs a massive road diet and significant pedestrian and bicyclist safety improvements for it to work. The new railing is a big improvement! Previously there was about two inches of clearance on each side of my handlebars. Now there’s more like ten inches. So I’d upgrade it from horrific to merely terrible. One unfortunate aspect of the new railing is there are sharp metal corners every ten feet, so if you do brush against it you have a good chance of slicing your arm wide open. That can and should be fixed. And yeah, passing is still a problem. Opening a second pathway so they can be one-way would fix this and should be possible. Either the other side of Posey or one side of Webster. That is a lot more practical than a bridge. Agreed. Notice the grid pattern of streets everywhere in Alameda except out there. There’s no pass through alleyways for peds or bikes out of the area, including the safeway right around the corner. Grids =! Super Dense City. Yet I hear it all the time. Bicycling and walking certainly are terrible. Even though I live less than a mile from the tunnel, I detoured via the Park Street Bridge that day, like I do many days each week. It’s a long detour, and Kennedy Street roadworks made that ride quite treacherous, but I still prefer it to choking and hacking my way through the tunnel! A bike bridge to Jack London Square is my biggest infrastructure wish—I really hope becomes reality soon. But there are a lot of bike projects I’d like to see in Oakland and Alameda. Just better paint and signs would be a big help, especially in Oakland, since many trails run cold in that city and keep landing me in very bicycle-unfriendly conditions. Clearer directions at major intersections in Alameda would be a big safety win, too, and not expensive. Also, every time I ride alongside the old Fruitvale Bridge, I wonder if there are plans for restoring it for cyclists. It’s another place where bike lanes just disappear, and it would be nice for that historic railway bridge to be put to good use. Thanks for your feedback about the tunnel. I might try it again some day. My eyes are still burning from the last time I tried, though. Indeed. It really worries me when my health app says I’m more active than 90% of Alameda… I’m hardly a fitness freak! I’m new here and I love it, but there’s so much low-hanging fruit for making it more people-friendly, and the City just isn’t seeing it. Why did you think it would be easy to walk to the drive-thru burger joint? Is there a walkable In-n-Out anywhere? Sorry BikeWalk Alameda, but there is simply *way* too much marine traffic, sailboat races, and so forth for a drawbridge to be practical at that location. Whoever did your feasibility studies really dropped the ball on this one. The drawbridges work fine on the east end where very few boats venture, but it would be a complete disaster to try cutting off Barn Hill Marina, Marina Village Yacht Harbor, Fortman Marina, Grand Marina, Alameda Marina, 5th Avenue Marina, Union Point Marina, Embarcadero Cove Marina, Oakland Marina, Brooklyn Basin, a few yacht clubs, Coast Guard Island, and the various other Port of Oakland facilities from the rest of the bay. Yes, I’ve tried walking that area too. It’s a complete joke. More of the same car-centric design you’d expect to find in the South Bay. You’ve never walked far in your life? Are you a captive driver? Another reasonable alternative would be an aerial tramway like at Roosevelt Island in NYC. Interesting idea. I wonder how the costs compare between drawbridges and trams. It really just comes down to vertical clearance. If they chose to install a very tall drawbridge with 70′ of clearance at high tide, then it actually wouldn’t be a problem for the vast majority of vessels. It would still need to open for the very occasional working boat, dinner cruise ship, or Coast Guard clipper, but at least all but the very largest sailboats could fit under that. Unfortunately, 70′ is very high (imagine a 7 story building,) probably much more expensive, and would be quite lot of climbing, requiring huge ramps for bikes and wheelchairs. Unfortunately, any lower than that and this bridge would be perpetually opening and closing for all the countless sailboats that constantly traverse that part of the estuary and require 50′ or 60′ of clearance. Uhmmm…how about adding transit to that solution? Without a robust transit investment, Alameda Landing is just another car-centric, suburban strip mall and low-rise tract housing development. Had BART invested its energy in building a new line to include Alameda (instead of its car-dependent commuter rail station extensions), the Alameda Landing development could have bee constructed with greater density (and height) next to mass transit. Alameda Island could also benefit from a light rail system that connects its major commercial centers with downtown Oakland and other BART stations. Alameda doesn’t want Bart. The suburbs do. @Brian Keith – This was once my daily commute, I had to do that many times. I also had a pretty constant hacking cough, it’s as if I’d taken up smoking. Why shouldn’t it be easy to walk there? Why couldn’t they add some amenities to cross the street on foot and enter? People live nearby, people can sit inside, and it’s right in the middle of everything. Terrible location for a drive-through restaurant and a pedestrian/bike fail. Keep my personal life out of this. Your personal life is fair game though. You must be one of those radical walksie-bikesie people that is on the losing side of history. Actually I do not bike but I have nothing against it, unlike you. I suppose you hate hiking, too? If my personal life is fair game, then yours is too. I agree, Dexter. I also have nothing against cycling, although I do have an issue with the aggressive riding habits of some urban cyclists, and the rather presumptive attitude of some bike advocates about their importance versus other road users. That’s not how this game is played Dexter. Because I live on Alameda, not in Los Angeles. This isn’t a suburban wasteland, but In-And-Out don’t seem to have noticed. Aerial cable-propelled tram to West Oakland BART was proposed as a low capital cost transit solution in the 2005 Alameda Point Transportation Strategy (on page 38 of 125) http://www.alameda-point.com/resources/pdf/tswebdec05.pdf . Why didn’t city & county planners hold the developers responsible to build it this novel solution? In 2005, aerial cable-propelled tram was proposed in Alameda Point Transportation Strategy (on page 38 of 125) http://www.alameda-point.com/resources/pdf/tswebdec05.pdf . Berkeley has a bike/pedestrian bridge over Interstate 80. Is it really that difficult to build the same for Alameda to Oakland over on Estuary? Have you seen a terrified cyclist mistakenly on the roadway in the tunnel trying to grab onto the railing for their life? I have. Keep the discussion open about alternative paths.